Turkmenistan’s pledge to take Azerbaijan to court over the two countries’ rival claims to Caspian Sea oil fields has sparked more confusion than anger in Baku. Some Azerbaijani experts even believe that an international arbitration hearing could prove the best way to resolve a long-standing energy dispute. At a special July 24 government meeting in Ashgabat, Turkmen President Gurbanguly Berdymukhamedov ordered Foreign Minister Rashid Meredov to have lawyers investigate the legitimacy of Azerbaijan’s claims to the Omar, Osman and Serdar fields. These fields are known as Azeri, Chirag and Kapaz in Baku. Berdymukhamedov also expressed a desire to probe the legality of foreign energy companies’ participation in the fields’ development. Berdymukhamedov called for the lawyers’ findings to be sent to an unspecified international arbitration court, according to the Turkmen state-owned TDH news agency. The fact that a BP-led consortium has already begun development work in the Omar/Azeri and Osman/Chirag fields under a 1994 agreement with Azerbaijan suggests that Baku holds a "one-sided" approach to the issue, Berdymukhamedov said. "Such one-sided work practices in the Caspian are unacceptable for Turkmenistan." The fields, together with the Azerbaijani-owned Guneshli, hold an estimated 620 million tons of oil reserves. Serdar/Kapaz holds about 50 million tons. Turkmenistan’s announcement took Baku by surprise. The Turkmen government had made no statement about disagreements with Azerbaijan after July 15-17 bilateral talks in Baku that focused on resolving the Caspian Sea’s legal status. And on July 9, State Oil Company of the Azerbaijani Republic (SOCAR) President Rovnag Abdullayev visited Ashgabat, where Berdymukhamedov emphasized "Turkmenistan’s commitment to develop[ing] friendly relations with neighboring Azerbaijan." Azerbaijani officials have taken the Turkmen announcement in stride. 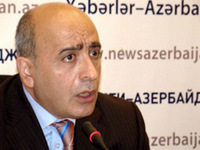 Deputy Foreign Minister Khalaf Khalafov, who is responsible for the Caspian Sea negotiations, told ANS TV on July 27 that Azerbaijan will defend its interests in the development of Caspian oil fields by all possible means. "As early as the early 1990s, Azerbaijan conducted detailed research concerning these fields and our position now is fully legal," Khalafov said. Baku energy and political experts are at a loss to explain the timing of the Turkmen move. One analyst said it was "strange" that Berdymukhamedov decided to pick a legal fight with Baku at a time when both states have been exploring cooperation on large-scale energy projects, including potential participation in the Nabucco pipeline. Another political analyst in Baku suggested that Azerbaijani officials could turn the Turkmen leader’s announcement to their own advantage. Seeking arbitration "is better that than endlessly keeping the problem unresolved, poisoning bilateral relations, blocking cooperation and letting third countries play off the existing hostility [between Azerbaijan and Turkmenistan on this question]," said political analyst Rasim Musabekov. "If there is no way to solve it by bilateral talks and Ashgabat wants to appeal to international arbitration, I see no reason why Baku should be against that," he added. Another analyst believes the Turkmen announcement provides Azerbaijan with a potential pretext to scuttle the development of a pipeline network -- including both Nabucco and a trans-Caspian pipeline -- that would circumvent Russian control. Baku has long been a supporter of the US- and European Union-backed alternate delivery path, but in recent months Azerbaijan has started to send out contradictory signals about its commitment to Nabucco and other Western-backed projects. While Azerbaijan remains involved in the development of Nabucco, Baku’s energy relationship with Moscow has intensified of late, a fact underscored by Azerbaijan’s deal with Gazprom concerning natural gas supplies from Stage 2 of the Shah Deniz gas field project. Some experts believe that Azerbaijani officials are calculating that an expansion in energy cooperation with Russia will pay off via increased Kremlin support for Baku’s stance in the Nagorno-Karabakh peace process. At the same time Moscow-Baku energy ties have been developing, the relationship between Russia and Turkmenistan has been rapidly deteriorating. Ashgabat has recently reduced its supply contract with Gazprom and signed a contract for exploration and development of its Caspian Sea gas reserves with RWE, a German entity that is a member of the Western-backed Nabucco pipeline consortium. Nabucco in mid-July took a significant step forward with the signing of an intergovernmental agreement on transit arrangements. While Turkmenistan did not sign the Nabucco transit deal, it is regularly touted as a potential supplier for the pipeline. To block the possibility Turkmen participation in Nabucco, Moscow may try to use Baku, political analyst Ilgar Mammadov said. "Turkmenistan’s move is probably the last chance for Russia," Mammadov suggested, referring to Moscow’s desire to block the construction of a pipeline network that the Kremlin can’t control. "If Moscow wants Azerbaijan to block the Trans-Caspian and Nabucco pipelines, it has to respond positively to Baku’s efforts for a resolution of the Karabakh conflict [with Armenia]." Without that incentive, Mammadov continued, Baku would be disinclined to do Russia’s bidding. Instead, Baku would be content to seek an arrangement that would settle Turkmenistan’s claims and allow the Nabucco and trans-Caspian pipeline projects to proceed. [Editor’s Note: Ilgar Mammadov is a board member of the Open Society Assistance Foundation -- Azerbaijan, which is affiliated with the Open Society Institute (OSI) in New York. EurasiaNet.org operates under OSI’s auspices]. If it comes to arbitration, many experts in Baku believe Azerbaijan would prevail. Turkmenistan’s claims to the fields "are groundless," argued Rustam Mammadov, a law professor at Baku State University and an expert on Caspian Sea legal issues. "Azerbaijan enjoyed the right to these fields under the USSR, and, in the case of the Caspian Sea, the standard legal principle applies: The owner is [that country] which owned it before," Mammadov said. That position, though, may be a matter of perspective. Berdymukhamedov claims to be in possession of Soviet-era documents that clearly define all the disputed fields as being located in the Caspian Sea’s Turkmen sector.